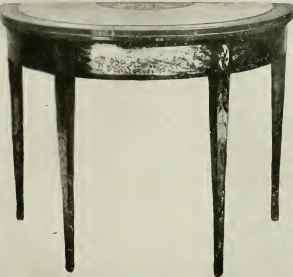 A typical Sheraton table with inlay on the front and with tapering, reeded legs proportion. The seats were usually upholstered. Hepplewhite preferred mahogany for most of his work, using satinwood and rosewood moderately to meet special demands. Hepplewhite was not a great carver like Chippendale, nor so finished an artist in inlay as was Sheraton, but he employed both carving and inlay with restraint and success. His sideboards, especially, were often embellished with fine, delicate inlay of satinwood, tulip-wood, sycamore, rosewood, maple, yew, holly, and ebony, with little or no carving. He was fond of delicate vertical patterns on the legs of tables and sideboards; straight parallel lines, the husk or wheat-ear, the meander pattern, and the Greek fret were favorite motifs. His carving was well executed and in low relief, and included the wheat-ear, the draped urn, and, on his oval chair-backs, the three feathers of the Prince of Wales. "Designs of Household Furniture," published in 1791, shows a style similar to that of Hepplewhite, but a trifle heavier. During the Georgian period there were a number of pieces of furniture made by other cabinet-makers that are worthy of attention, notably desks and secretaries and clockcases. Tall clocks were made with both square and broken-arch tops, and often veneered or inlaid. Secretaries and escritoires developed in similar fashion, first having ball feet, then short cabriole legs with ball-and-claw feet, then ogee or bracket feet, and finally short, turned legs of the Adam and Sheraton school. Four-poster beds became lighter and more graceful, those of Hepplewhite being particularly graceful. Thomas Sheraton, the last of the great Georgians, and in many respects the most artistic, published his "Drawing-Book" in 1793 and produced his designs well into the nineteenth century. His later work was degenerate, but in his best period it was unsurpassed for delicacy, grace of proportion, and restraint. Though less versatile than either Chippendale or Hepplewhite, he was artistically more correct. His style, leaning toward the Louis XVI, shows strongly the Adam influence. treatments, and handled them masterfully. His furniture is fragile-looking, but is well made. A distinguishing feature is the tapering leg, usually round, often reeded, and exquisitely shaped. Sheraton was not only an artist in design, but a master in the use of woods. He employed satinwood almost as much as mahogany, and also other exotic and native woods. Not a little of his furniture was beautifully decorated with gilding and painting. Carving was always a secondary matter with Sheraton; form and color were what he sought. He was a master at inlay. Some of his finest work shows classic ornaments and borders in marquetry of sycamore, kingwood, satinwood, and green-stained whitewood set into both light and dark mahogany. His carving was always in low relief, and included such classic motifs as the urn, vase, lyre, cornucopia, wreath, and musical instruments. Sheraton used an oval chair-back borrowed from Adam, but his typical chair-back was rectangular, with the top line broken. Within the frame were various forms of straight-line work, or such carving as the vase or urn. He seldom used the shield-shaped back of Hepplewhite and never the pierced splat of Chippendale. eluding tables, sideboards, bureaus, ingeniously arranged desks and writing-tables, sofas, slender four-poster bedsteads, exquisite bijou pieces, etc. With Sheraton the development of English style in furniture properly ends, for after him came confusion, followed by the heavy, graceless forms of the nineteenth century. 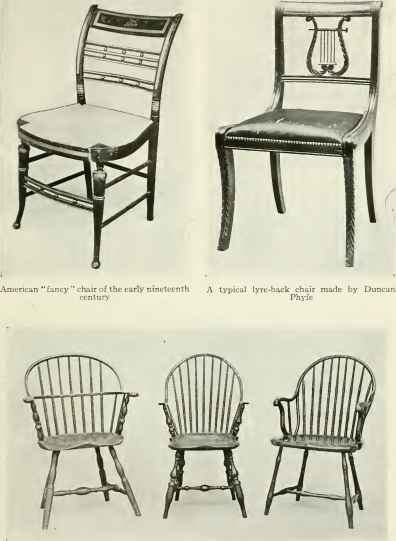 ALTHOUGH there are some interesting things to be recorded in reference to American-made furniture, so far as the student of styles is concerned, the whole may be covered in a single chapter. Not that American furniture was unworthy, but the styles followed those of the mother-country so closely that there is no separate process of development to be noted. With a few noteworthy exceptions—the Windsor chair, the furniture of Duncan Phyfe, and the styles of the so-called American Empire period—an understanding of the English styles, as already outlined, would furnish a working knowledge of American furniture styles. Before proceeding, it may be well to come to an understanding on the definition of a much-abused word—Colonial. As often as not, any furniture of the Georgian period, English or American, is called Colonial, which is, of course, a misuse of the word. More often the name is given to all old American furniture up to 1840. One finds it particularly applied to nineteenth century or American Empire furniture, to describe something that is not Chippendale, Hepplewhite, or Sheraton. All of which is careless, erroneous, and misleading. Obviously, the only proper use for the word Colonial is to distinguish the products of the colonies before they became states. For post-Revolutionary furniture and other objects we must find a more accurate nomenclature. Beginning, then, with the furniture of the colonies, we find that the homes of the seventeenth century were furnished partly with things brought over from the old country and partly with things made here after imported patterns. Not a little variety is to be discovered when the various colonies are considered. The English, the Dutch, and the Huguenots all contributed their national elements. In New England there was chiefly English and homemade furniture, the plainer forms predominating. In the South the furniture was nearly all imported, and more carved oak and upholstery was to be found. In New York the pure Dutch prevailed, including such prominent pieces as the has, a large wardrobe or cupboard which was usually gaily painted or inlaid. The furniture of New England is typical of most of that which was brought to this country or made here. During the seventeenth century there were many American cabinet-makers at work, of greater or less skill. They produced the current English styles, as well as local variations, employing not only oak and walnut, but such native woods as came easily to hand—hickory, ash, elm, maple, pine, cedar, cherry, birch, etc. During the first half of the eighteenth century we find the English styles of the Anglo-Dutch period, though always lagging a few years behind the contemporary English fashions. 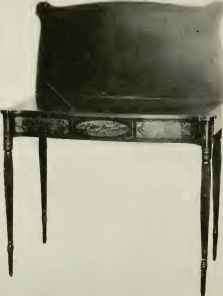 The Queen Anne fid-die-back chair, for example, became popular here about 1730. Much cottage furniture was used during this period—rush-bottomed roundabout, slat-back and banister-back chairs, etc.—as well as comfortable, upholstered easy chairs with wings. Mahogany became common about 1740, and between 1750 and 1775 American furniture-makers produced work that compared favorably with that of England. Early Georgian styles were followed, shortly before the Revolution, by the Chippendale vogue. The Hepplewhite wave reached us so soon after the war that it never gained the foothold that the Sheraton style did. Still, we find a good many Chippendale, Hepplewhite, and Sheraton pieces, particularly chairs, some of them made directly from English designs, others displaying more or less striking modifications. Before taking up American furniture of the nineteenth century, there is one interesting and rather important American contribution to be considered —the Windsor chair. There was an English Windsor chair, and ours was based upon it, but the American chair-makers carried its development much farther and produced something much more varied and graceful. The Windsor chair flourished from 1740 to 1820 and appeared in many forms—side-chairs and armchairs, loop-backs, hoop-backs, fan-backs, comb-backs, and low-backs. These variations offer an interesting opportunity for special study which it will be necessary for us to forego. All forms were made of hickory, ash, etc., and were painted. The back was a graceful outline filled with parallel spindles. The legs were turned and raked; the wooden seats were pleasingly shaped. principles. There were Sheraton chairs and near-Sheraton chairs, Sheraton and Hepplewhite bedsteads, excellent Sheraton sofas and Sheraton sideboards, both pure and modified, which marked these two decades as among the most refined in the decorative history of America. A number of purely American variations of this period are worth a glance. There was the so-called fancy chair, for example, which was popular about 1800-1830. It was made of light, soft wood, painted and decorated with gilt, with rush or cane seat, straight turned legs, and a fairly low back which usually had horizontal slats or rungs. It was made with and without arms. The Empire influence followed that of Sheraton. It had already invaded England, affecting the work of Sheraton himself. Some of the English adaptations of the Empire possessed merit, but most of them did not. They showed a tendency to go to grotesque extremes of style. The English designers seem to have lost their ability to absorb foreign elements. The metal-work was poor and the carving coarse. Taste was at a low ebb, and the English public accepted fantastic novelty as a substitute for originality, and the lavish massing of material in place of good lines and finely wrought details. But America had broken away from England and did not at once follow her into the artistic quagmire. We, too, fell under the spell of the Empire, but we did not take it over, lock, stock, and barrel. Actually, the Empire influence was merely an active ingredient of a truly American style, which existed nowhere else and which was not without distinction, character, and artistic merit. This is the style sometimes referred to as late Colonial, or American Empire. Neither term is accurately descriptive. Some one has suggested Jef-fersonian, and I am not sure that it might not suffice. Jefferson was an amateur architect and something of a leader in artistic thought, a devotee of the classic and a friend of France. How much he had to do with the furniture styles I do not know, but it was probably as much as Queen Anne had to do with those which bear her name. It was, quite markedly, a Jeffersonian period. The furniture of this time showed Empire influence strongly, but it differed materially from the French Empire furniture or the English imitation of it. There is actually little in common, for example, between a French Empire chair and an American Jeffersonian chair. was more elegant than that of the next decade. It was a prolific period, and mahogany was plentiful. The demand was for an abundance of carving. Carved columns, claw-feet, pineapple finials, and ornamental brasses were features. They were all a bit coarse, but at least our forefathers had the good sense not to import the exotic Egyptian extravagances which debased the styles of France and England. Massive furniture was the rule, with posts and supports often carved in pineapple and acanthus-leaf patterns. The plainer type of Jeffersonian furniture belongs properly in the decade 1820-30, though there was an overlapping of the two types. It lacked the elegance and distinction of the carved mahogany, and the sense of grace and proportion seems to have been weakening. Quantity of material appears to have been a requirement, with wide, veneered surfaces and frank, rudimentary curves. But with all its faults, we love it. It was native American; it was our own. And not infrequently we discover a justification for our prejudice in the wonderfully grained crotch mahogany that was used on much of this furniture. Following the chairs of Sheraton type came a sort of transition or mixed style, and then a type of chair in which the Empire influence may be traced. 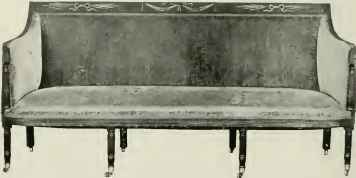 Roll ing back, continuous curves in sides, stiles, and legs, lyre-shaped splats, and occasionally brass feet, were among the distinguishing features. Some of these chairs were made of solid mahogany, some of maple and birch, and some were painted, but for the most part they were of veneered mahogany. A popular chair of the 1830-40 period had a rather heavy, curved back, a vase-shaped splat, and flat legs. The type is said to have been based upon an original in the library of Napoleon at Malmaison. The sofas were, on the whole, more noteworthy than the chairs. The best of them were distinguished by good proportions and good workmanship. Apart from the Sheraton types, and generally following them, there were rather elaborate sofas, with carved or paneled top rails, dolphins or cornucopias on the fronts of the arms, and carved feet in the form of large lions' paws, surmounted with wings or with fruit and flowers. The curved lines of legs and arms were pleasing, and the proportions were generally good. After 1810 the sweeping swan's-neck arm became popular, and a touch of the Egyptian sometimes appeared in the feet, in the form of winged claws. Later came plainer, heavier forms, with less carving or none at all, plain surfaces of veneer, and rolling arms and backs. One of Phyfe's eight-legged sofas. The back panels are beautifully carved and the slight swing of the arms is most graceful. Owned by R. T. Haines Halsey, Esq. The tables of delicate Sheraton character gave place to sewing-tables and Pembrokes with four vertical legs, often spiral, and frequently drawers with glass knobs. Another form had a central support, turned or gadrooned, and concave, tripod legs. The acanthus and pineapple carving appeared on central supports which rested on plinths supported by claw or ball feet—an elegant and symmetrical form, if not delicate. Then came heavier ones, with veneered surfaces, round, octagonal, square, and lyre-shaped supports, and plinths resting on four scroll feet. With the passing of the Sheraton designs, the sideboard became less graceful. The body was brought down nearer to the floor. The slender legs gave place to massive, round, twisted, or rope-shaped pillars, extending to the floor, often finished with a bear's or lion's foot of carved wood or brass. This sideboard was usually long, and had three drawers beneath the top. Below these were usually three cupboards, the middle one being wider than the other two and fitted with double doors. The cupboard doors were generally paneled with selected mahogany veneering. The fronts were straight, or simply curved. The drawer-pulls and door-handles were brass or glass knobs, or brass rings set in rosettes or lions' heads. Sometimes there was a paneled upright piece at the back of the top. Only a moderate amount of carving was employed, as a rule. After 1820 the sideboard became plainer. It usually had four legs, turned feet, turned pillars at the front corners, deeper drawers, and a single cupboard below. A butler's desk occasionally took the place of the middle drawer. Low chests of drawers and bureaus followed, in general, the styles of the sideboards. They were, for the most part, heavy and massive. The earlier ones had reeded or acanthus-carved columns, plain veneered drawer-fronts, and turned or claw feet. The carving was rather coarse, but effective. The plainer types followed, without carving, the side supports sometimes swelling out in flat-surfaced curves, and the upper drawers sometimes having a vertically curved front. Writing-desks, escritoires, and secretaries followed a similar style development. Secretaries, or bookcase-desks, became more common, the broken-arch pediment, block front, and carved feet disappearing and giving place to the horizontal cornice, turned feet, and sometimes swelling curves at the sides. Though the most pleasing four-post bedsteads were of the Hepplewhite and Sheraton types, there were some in the Jeffersonian period that were rich, dignified, and interesting. The carving was often well executed, if somewhat coarse and overpowering. Heavy, mahogany posts were carved in forms which included the anthemion, the acanthus, laurel-leaf, horn of plenty, pineapple, and feathers, with reeding, gardrooning, and rosettes. The pineapples became especially popular after 1810. Sometimes these posts present the effect of a somewhat meaningless piling up of pineapples, acanthus leaves, fruit, flowers, and twists, like totem poles. Head-boards and foot-boards took various forms. Sometimes the posts were surmounted by a tester; sometimes not. Later forms of the four-poster are rather lacking in merit, some of them having enormous round or octagonal pillars, displaying no taste at all. Low-post bedsteads were made at the same time, some of them with posts carved in the acanthus and pineapple patterns, and some of them in plainer design. The bedsteads of the less well-to-do were usually of maple or cherry, though mahogany, oak, walnut, and other woods were used for this type. Simple, turned posts and plain head-boards and footboards were commonest. After 1820 a bedstead without posts, called the sleigh-bed, came into vogue. It suggests an Empire derivation. It had a rolling head-board and foot-board and broad, flat-surfaced legs, and was usually made of mahogany veneer. During this period there was one cabinet-maker who was turning out a superior quality of furniture that belongs in a class by itself, and that in many ways equals the best work of Hepplewhite and Sheraton. Duncan Phyfe of New York based his designs on the Adam and Sheraton styles, later modified by the Empire influence, but he worked out a style all his own. He was a Scotchman who came to America about 1784. He later started in business in New York, and was well established by 1795. His work varied with the changing fashions and may be divided into three periods: From 1795 to 1818 the Adam-Sheraton influence was pronounced; from 1818 to 1830 Empire features are to be observed; from 1830 to 1847 Phyfe's work degenerated with the rest of American furniture and he produced the over-decorated mahogany and rosewood which he called "butcher furniture." Phyfe's earlier furniture was fine in every way. His mahogany chairs, sofas, and tables showed remarkable design, workmanship, and finish. He had a splendid feeling for line and proportion; he was a master of the curve; he showed rare taste, restraint, and skill in carving. He employed the lyre, the acanthus, various Adam and Sheraton forms, parallel rows of reeding, the concave leg, and other details with a masterful touch. He used no inlay, except tastefully arranged panels of the same wood. In short, Phyfe's furniture is as worthy of study as that of the great Georgian cabinet-makers of England. After 1830 American furniture styles degenerated, and after 1840 there was no style worthy of the name. Heavy machine-made things followed. There came the fashion for rosewood and for black walnut, a Japanese and a Gothic craze, both poorly carried out, and the styles promoted by Eastlake. Within our time we have had the vogue of L'Art Nouveau and Mission. At last we seem to have arrived happily at the point of realization that novelty does not necessarily mean advance, and we have begun to hark back to the best elements of the past, just as the masters of the Renaissance and the proponents of every classic revival have done. The twentieth century is witnessing a marked improvement in popular taste and an encouraging awakening of appreciation of the beautiful, which may, after the war, result in something like a new Renaissance. Chiefly oak, without varnish. Also elm, beech, and chestnut. • After Edward IV, deal and cypress. Chiefly oak. 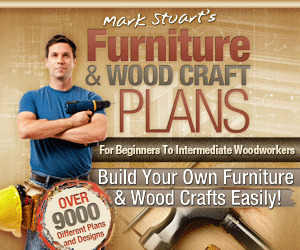 Also beech, elm, chestnut, cherry, ash, yew, walnut, cypress, pear, etc. Same as the early Tudor. Same as Jacobean, with walnut added. Walnut following oak. Some cedar, beech, ebony, and tropical woods. Cane work and upholstery. Architectural form. Carved and pierced tracery. Geometric patterns; pointed arch, trefoil and quatrefoil, wheel, rose, linen-fold. Gothic survivals, including the linen-fold, with the Tudor rose and Italian Renaissance details added, also the cinquefoil and tongue of flame. Freer carving with more Italian and Flemish Renaissance details. Portrait medallions, heraldic motifs, diamond and lozenge panels, fruit and foliage. Bulb or melon form on supports. More movable character; forms still rectangular. Perpendicular legs and chair backs. Carving and paneling. Turned legs, including spiral. Strap-work and scroll-work. Rounded arch, concentric circles and running figure eights. Arabesques and lunettes, semicircles filled with petals. Heavy forms> lacking grace. Turned work, split balusters. Architectural note gone. Italian, French, and Flemish influence. Furniture lighter and more graceful. Elaborate pierced carving: some inlay. Scroll-work, cresting; crown and tulip. Chests and coffers; cupboards, cabinets, armoires, credences, buffets, trestle tables, joint stools. Cupboards, presses, chests, ornate bedsteads, turned chairs, stools. Long refectory tables, wainscot chairs, curule chairs, cupboards, massive four-post bedsteads. Turned and wainscot chairs, refectory tables, small tables including early gate-leg. Court and press cupboards. Solid chairs with padded leather seats and backs. Plain tables. Drawers added to cupboards and chests. Carved high - backed chairs, with cane or upholstery. Refectory tables, gate-leg tables. Cupboards, chests of drawers, day beds, tall clock cases. Sir William Chambers, architect. Thomas Chippendale, cabinet-maker. 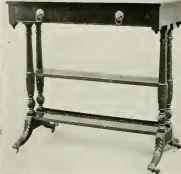 Thomas Chippendale, cabinet-maker. R. & J. Adam, architects and designers. Josiah Wedgwood, potter. George Hepple-white, cabinet-maker. Thomas Sheraton, cabinet-maker, designer. Chiefly walnut; also oak, cedar, chestnut, beech. Lacquer and veneer. Inlay of beech, holly, birch, yew, pear, box, ebony, etc. Carved pear, lime, and pine. Rush seats and upholstery. Walnut, followed by mahogany. Some oak and other woods. Chippendale: chiefly mahogany; also walnut, maple, cherry, beech. Adam: mahogany, satinwood, painted soft woods, inlay of exotic woods. Hep-plewhite: mahogany chiefly, inlay of rosewood and exotics. Sheraton: mahogany and satinwood, some rosewood; painted and gilded beech and birch; fine inlay and veneering. Domestic character. French and Dutch influence. William and Mary : Louis XIV details, turned legs, often with inverted cup or bell, shaped underbracing, square cornices. Queen Anne: more curves, cabriole leg and Dutch foot, curved chair backs, fiddle-shaped splat, double-arch pediments on cabinets, etc. Less marquetry. Less carving; shell, cartouche, etc. Transition from Queen Anne to Chippendale. Broken-arch pediment, urn, cabriole leg with ball-and-claw foot. Pierced splat. Great variety, fine cabinet work. 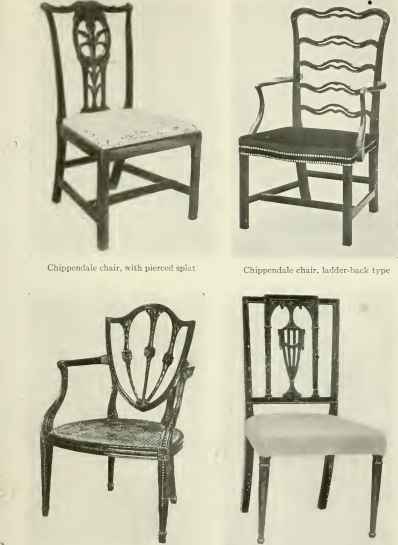 Chippendale : French, Gothic, and Chinese details; ribbon-back and ladder-back chairs; bow top and pierced splat; cabriole and square legs; rococo and Chinese carving. Adam: classic details, slenderness, fine proportions; urn, carved wreath, oval sunburst, acanthus, festoon. Hepplewhite: classic details; husk inlay; shield-shaped, heart-shaped, and oval chair backs; square legs and spade feet; draped urn. Sheraton: classic detals; straight lines; delicate proportions; rectangular and round chair backs; tapering, round, reeded legs, urn, vase, lyre, cornucopia, wreath, etc. Variety of chairs, including roundabout. High chest of drawers followed by highboy. Lowboys, tea and card tables, escritoirs, dining-tables, bureaus, cabinets, clock cases, mirrors. Largely the same as Queen Anne. Nearly all modern forms. Chairs, desks, tables, cabinets, sideboards, dressing - tables, four-post bedsteads, sofas, bureaus, secretaries, book-cases, mirrors, clock cases, bijou pieces, etc. Chestnut, oak, and other woods. Italian craftsmen, including da Vinci, del Sarto, Cellini, and Seralio. Oak, walnut, chestnut, etc. Some ebony. Cushions followed by upholstery. J. Charles Berain, cabinet-maker. André Charles Boulle, cabinet-maker. Oak, walnut, chestnut, and ebony. Also cherry, etc., gilded. Inlay of rosewood and exotic woods. Boulle inlay and marquetry. Upholstery, chiefly tapestry. Similar to the English Gothic, but somewhat more florid. François I : Italian Renaissance adaptations. Fine carving, good workmanship. Carving more open than the Italian. Style becoming ' less architectural. Turned legs and supports. Henri II : Added details in carving, including strap and band, pierced shield, arabesque, lozenge, cartouche. Later, shell and scroll carving, swags and garlands. More domestic type. Stately grandeur. Renaissance survivals, anthemion, acanthus, shell, scroll, arms, victor's palm. Pedestal legs followed by curved legs. Balanced details and symmetry. Similar to the English Gothic, but with greater variety. Chests, cabinets, chairs, tables, followed by sofas, divans, consoles, and other forms. Chests, cabinets, tables, consoles, chairs, sofas. Jean Henri Ries-ener, cabinet-maker. Juste Aurele Meis-sonnier, designer. Jean Francis Oeben, cabinet-maker. Charles Cressent, designer. Jean Antoine Watteau, painter. Francis Boucher, painter. Jacques Caffieri, metal worker. Simon Etienne and Robert Martin, lacquer. The same as Louis XIV, with mahogany added. Chinese lacquer followed by vernis-Martin. Ormolu mounts. Upholstery of silk, velvet, and tapestry. Some cane. Jean Henri Ries-ener, cabinet-maker. David Röntgen, cabinet-maker. Jacques Louis David, painter. Gouthiere, Pierre, metal worker. Chiefly oak, walnut, and mahogany. Other woods gilded and enameled. Ormolu and bronze mounts. Tapestry upholstery. Cane ; inlay. Jacques Louis David, painter. Percier and Fontaine, designers. Mahogany, solid and veneered, with metal mounts. Also painted, bronzed, gilded, and enameled woods. Upholstery of brocades, silks, and velvets in strong colors. Luxurious and ornate. Rococo predominating. Paintings of pastoral, Arcadian, and amatory subjects. Curved legs without underbracing. Unbalanced details. Ribbon and lace effects, natural flowers and hanging baskets, the broken shell, the twisted acanthus, the curled endive, the flowing scroll. Simpler forms; more grace; restraint, daintiness and refinement. Excellent workmanship. Straight lines and simple curves. Straight legs, usually round and fluted; round or rectangular chair backs; fluted columns. Classic revival; rococo dropped; laurel and oak leaf, Greek band, medallions, musical instruments, Cupid's quiver, baskets and garlands of flowers. Imperial formality. Straight lines and primary curves. Anthemion, bay wreath, torch, eagle, fasces, bee, liberty cap, laurel branch, Greek fret and honeysuckle, winged figures, helmeted heads, trophies and weapons, lion's foot, letter N, sphinx. Same as Louis XIV, with a greater variety of small cabinets and boudoir pieces. Chairs, tables, commodes, cabinets, bureaus, sofas, consoles, clocks, mirrors, sconces. 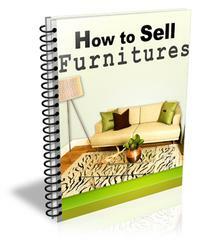 Types Of Furniture To Sell. There are many types of products you can sell. You just need to determine who your target market is and what specific item they want. Or you could sell a couple different ones in a package deal. How did they protect Jacobean gate leg tables?